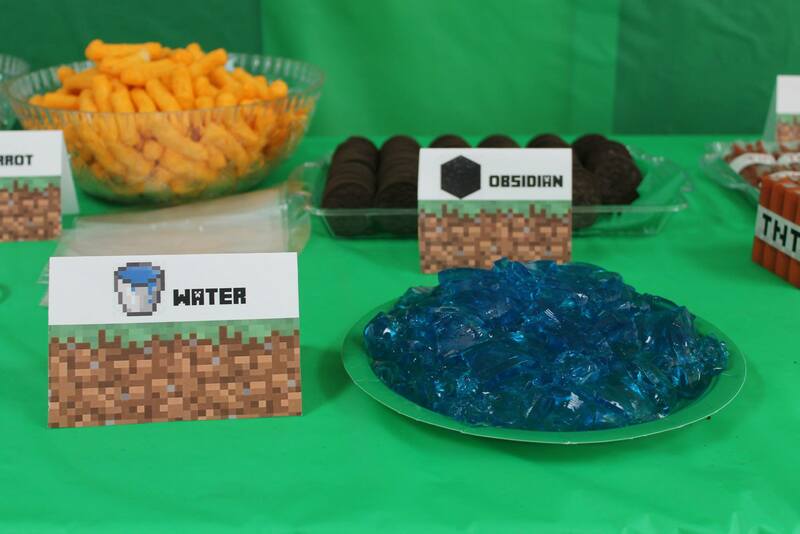 Disclaimer: I am by no means a Minecraft expert. I only know what my kids and husband tell me. A couple months ago we kept hearing what sounded like a kitten in the house. Keep in mind we don’t have pets but quite a few strays outside. So as you can imagine we were puzzled and worried one had snuck in the house and took up shelter. Come to find out the girls had added cats to their world. 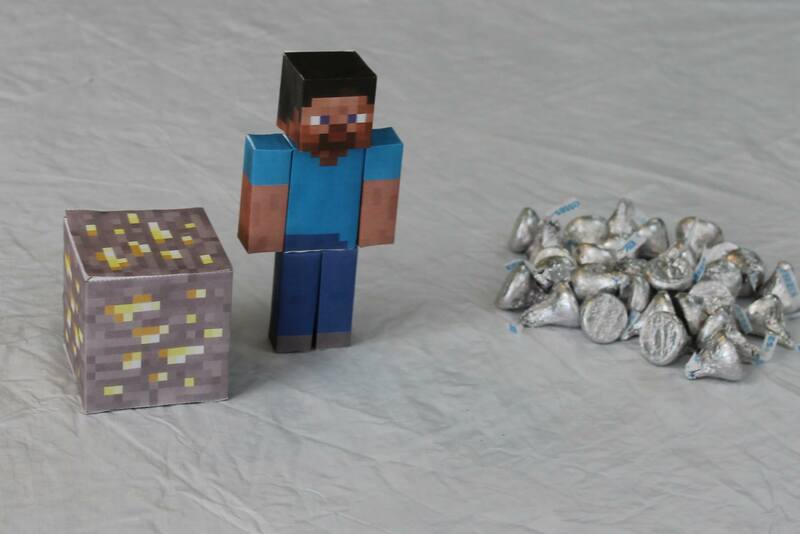 We started cracking up because Minecraft had pulled one over on us. Each year I allow the kids to pick out their birthday party themes. Until Josh and I got together Abby and Joshlynn had always had a combined birthday party (their birthdays are in March and April). As a child my birthday was a huge deal and I would not have liked to share it with someone else. That’s just me though. So I said right then and there that they would have separate parties from then on. 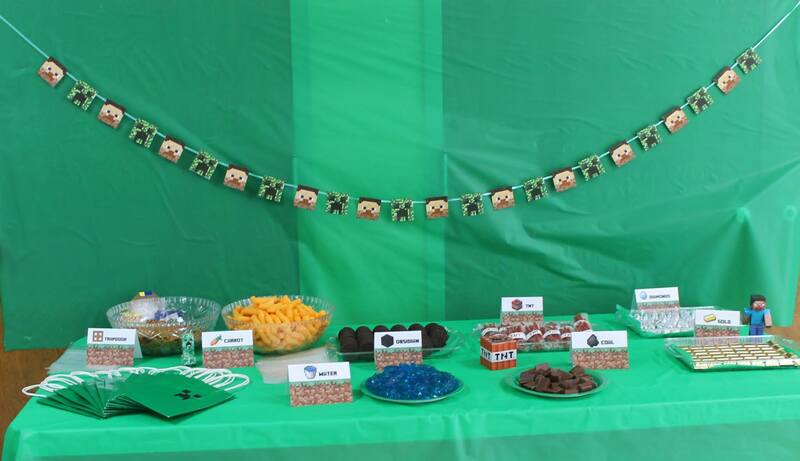 Since parties were a big deal to me…I go ALL out on my kids parties. Maybe a little “too all out” at times. But hey they are only little once and I want them to have their own day that is all about them. 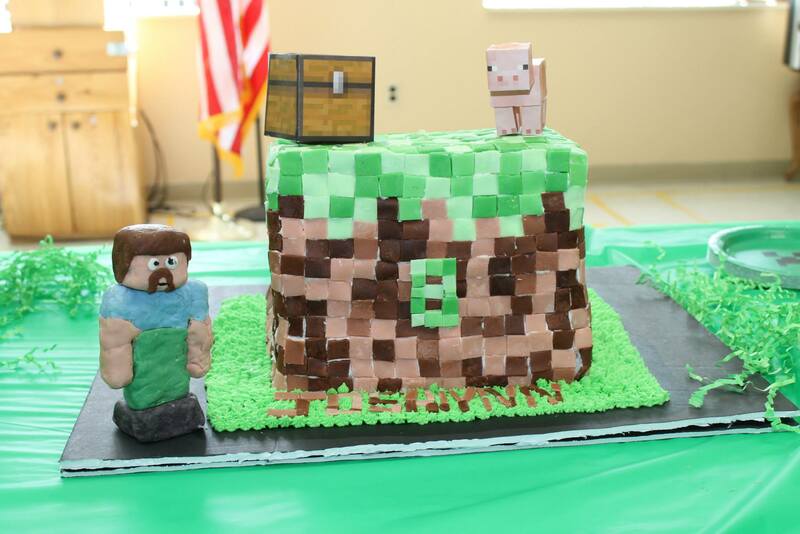 By far my favorite party that I have done for them to this point was Joshlynn’s Minecraft party last year. 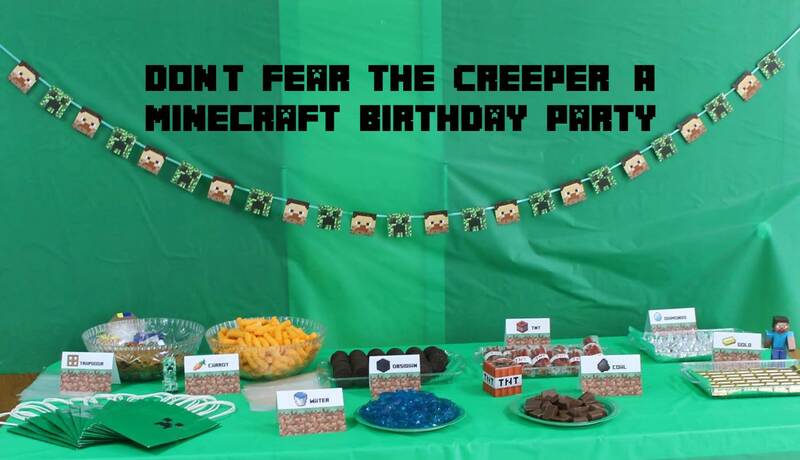 I spent countless days and hours preparing for this party. At the time you could not find anything in stores for decorating. That is when I headed to my trusty friend Pinterest! Ohh how I love Pinterest! I found everything I needed to make her party a success…and boy a success it was. 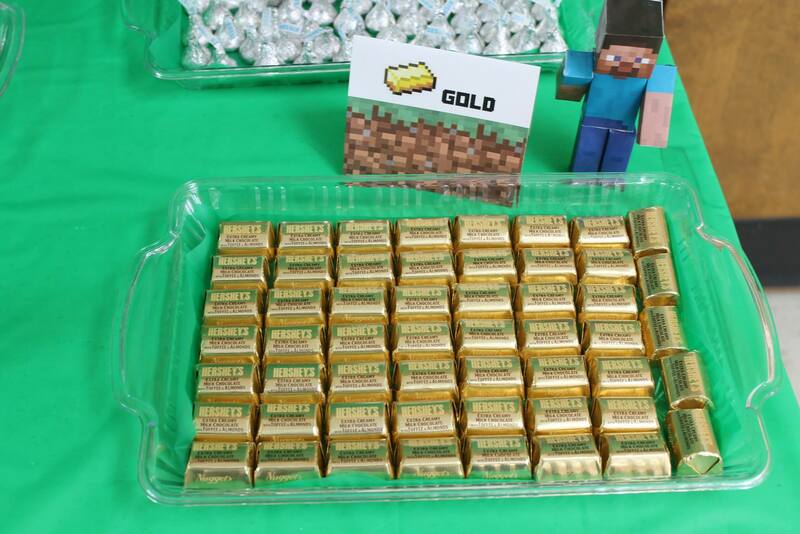 I know that Minecraft is still huge and now you can find about anything you want in stores. However, I figured I would share the links I found while planning to help save you some money. I’m sorry but sometimes spending countless hours doing something at home is well worth saving money. Can I get an amen from my other crafty mothers? Now on to the pictures….I know your excitement is killing you. 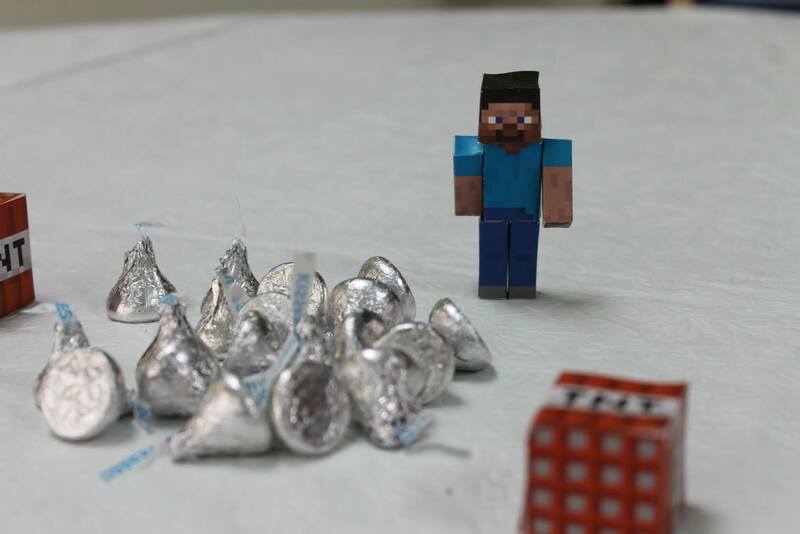 I went and researched important aspects of Minecraft and incorporated them into the party. I owe my sister a HUGE thank you for doing the tedious and absolutely aggravating task of putting the paper Steve’s, animals, and other pieces together. Notice how much detail they have? Go back and look at the chest and pig on the cake. I absolutely loved having these as accents at the party. These paper crafts can be found at pixelpapercraft.com. I highly suggest you visit this site and take advantage of these cute little things. Ohh boy were these fun….not! 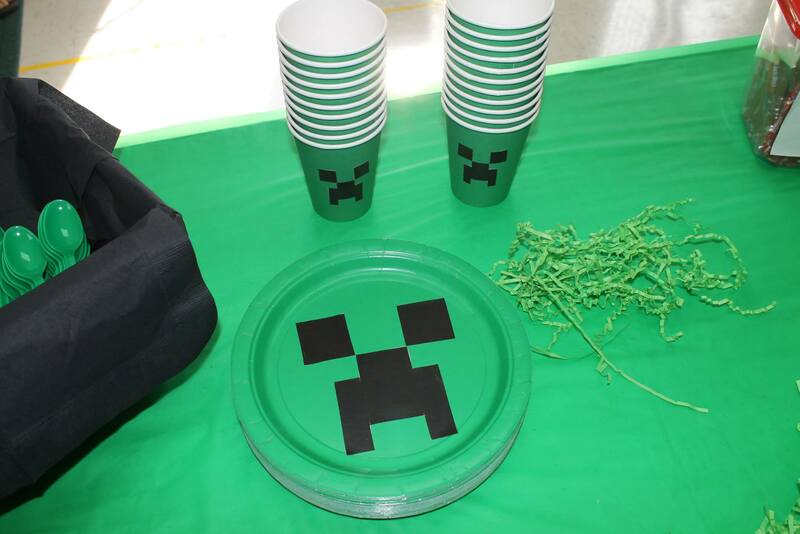 Each plate and cup had a Creeper sticker on it. Meaning that I had to print them out and place each and every one onto the cup and plate. But hey it was worth it because they were super cute. You can get these stickers from Etsy as an instant download. Unfortunately, the shop I purchased them from is no longer available. You can still go to Etsy and do a search for other shops that may carry them. I LOVED my goodie table after it was complete! 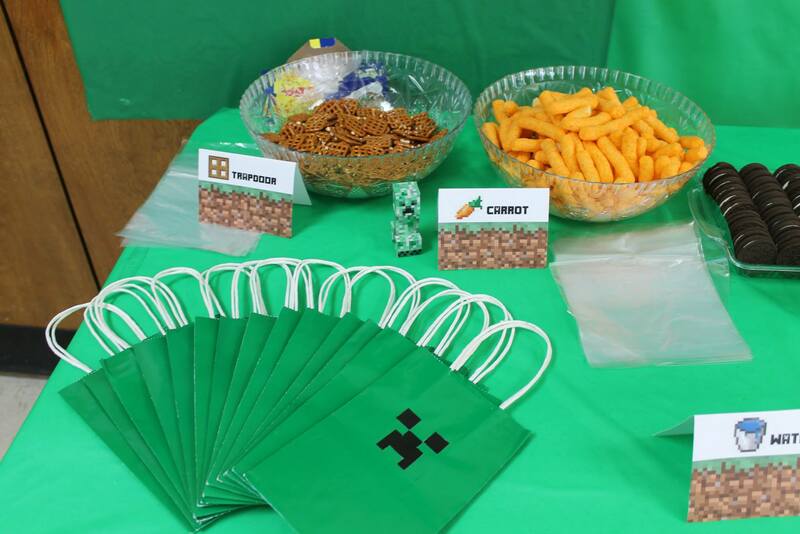 Each child got a creeper bag (look below) and they were able to go down the table and get the “materials” they need (wanted) for their world. The kids loved getting to do this! Let’s look a little deeper at what was on the table. I purchased the green gift bags from the dollar store and added some of the stickers I downloaded on the bag. The jello turned out so neat! To be honest it looking like that was an accident. I tried to be all OCD and cut it into squares but it didn’t work out. So I just scooped it out and laid it on the plate. I think it turned out waaayyy better than it would have with just squares. I just took Twizzlers and cut them in half and placed them in a plastic bag. The labels are scraps from the stickers I used on the plates and cups. I then took a red permanent marker and wrote TNT on the label. BAM! 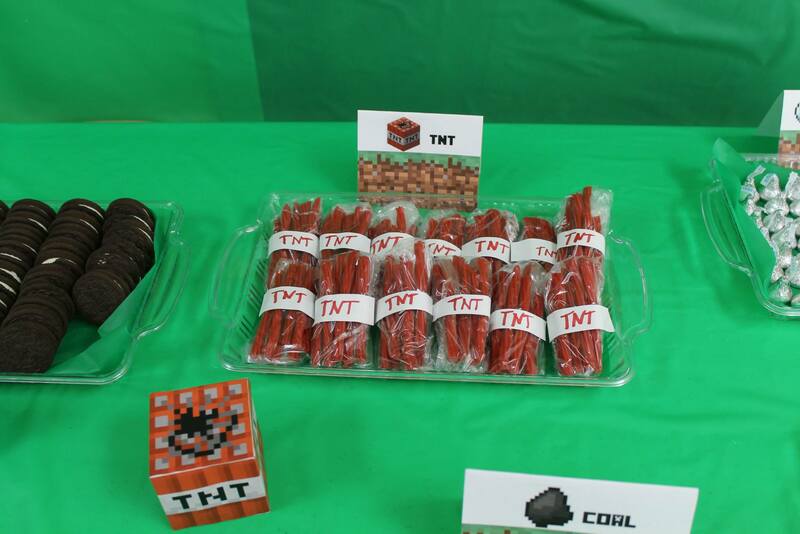 You have homemade, edible TNT! I ordered those awesome “materials” cards from Etsy too! 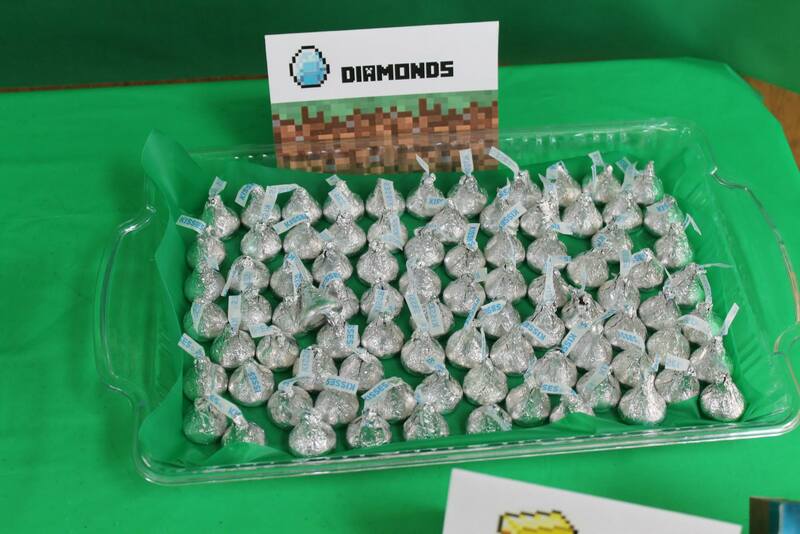 You can also download the Minecraft font to personalize items at your party here. This party was a ton of fun and Joshlynn absolutely LOVED it! I love seeing my babies happy and they had a ton of fun. 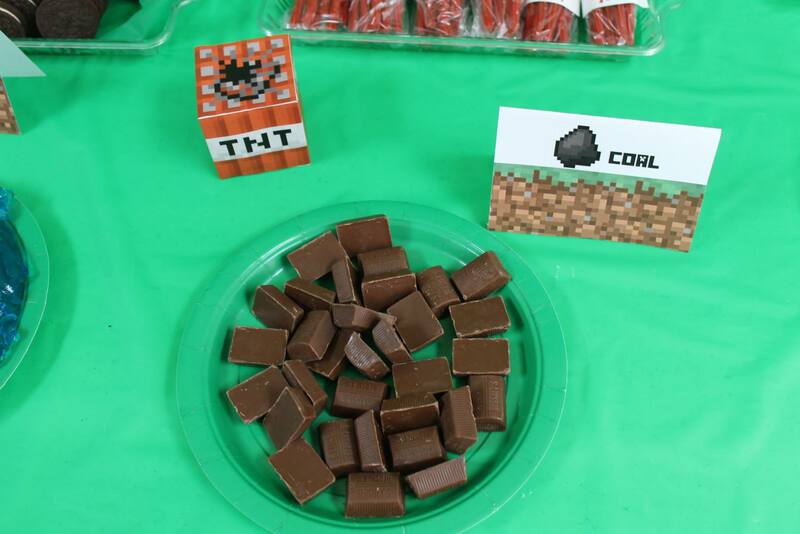 If you want to be the coolest mom on the block throw your kids a Minecraft party!